Spanish (/ˈspænɪʃ/ ( listen); español (help·info)) or Castilian (/kæˈstɪliən/ ( listen), castellano (help·info)) is a Romance language that originated in the Castile region of Spain and today has hundreds of millions of native speakers in the Americas and Spain. It is a global language and the world’s second-most spoken native language, after Mandarin Chinese. Spanish vocabulary has been in contact with Arabic from an early date, having developed during the Al-Andalus era in the Iberian Peninsula. With around 8% of its vocabulary being Arabic in origin, this language is the second most important influence after Latin. Additionally, it has absorbed vocabulary from other languages, particularly the Romance languages—French, Italian, Portuguese, Galician, Catalan, Occitan, and Sardinian—as well as from Quechua, Nahuatl, and other indigenous languages of the Americas. The consonant written u or v in Latin and pronounced [w] in Classical Latin had probably “fortified” to a bilabial fricative /β/ in Vulgar Latin. In early Spanish (but not in Catalan or Portuguese) it merged with the consonant written b (a bilabial with plosive and fricative allophones). In modern Spanish, there is no difference between the pronunciation of orthographic b and v, with some exceptions in Caribbean Spanish. Peculiar to Spanish (as well as to the neighboring Gascon dialect of Occitan, and attributed to a Basque substratum) was the mutation of Latin initial f into h- whenever it was followed by a vowel that did not diphthongize. The h-, still preserved in spelling, is now silent in most varieties of the language, although in some Andalusian and Caribbean dialects it is still aspirated in some words. Because of borrowings from Latin and from neighboring Romance languages, there are many f-/h-doublets in modern Spanish: Fernando and Hernando (both Spanish for “Ferdinand”), ferrero and herrero (both Spanish for “smith”), fierro and hierro (both Spanish for “iron”), and fondo and hondo (both Spanish for “deep”, but fondo means “bottom” while hondo means “deep”); hacer (Spanish for “to make”) is cognate to the root word of satisfacer (Spanish for “to satisfy”), and hecho (“made”) is similarly cognate to the root word of satisfecho (Spanish for “satisfied”). 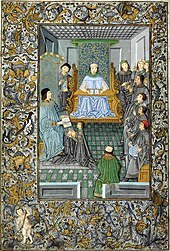 In the 15th and 16th centuries, Spanish underwent a dramatic change in the pronunciation of its sibilant consonants, known in Spanish as the reajuste de las sibilantes, which resulted in the distinctive velar [x] pronunciation of the letter ⟨j⟩ and—in a large part of Spain—the characteristic interdental [θ] (“th-sound”) for the letter ⟨z⟩ (and for ⟨c⟩ before ⟨e⟩ or ⟨i⟩). See History of Spanish (Modern development of the Old Spanish sibilants) for details. From the sixteenth century onwards, the language was taken to the Spanish-discovered America and the Spanish East Indies via Spanish colonization of America. 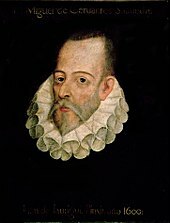 Miguel de Cervantes Saavedra, author of Don Quixote, is such a well-known reference in the world that Spanish is often called la lengua de Cervantes (“the language of Cervantes”). The language is classified as a subject–verb–object language; however, as in most Romance languages, constituent order is highly variable and governed mainly by topicalization and focus rather than by syntax. It is a “pro-drop“, or “null-subject” language—that is, it allows the deletion of subject pronouns when they are pragmatically unnecessary. Spanish is described as a “verb-framed” language, meaning that the direction of motion is expressed in the verb while the mode of locomotion is expressed adverbially (e.g. subir corriendo or salir volando; the respective English equivalents of these examples—’to run up’ and ‘to fly out’—show that English is, by contrast, “satellite-framed”, with mode of locomotion expressed in the verb and direction in an adverbial modifier). 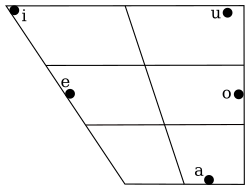 The Spanish consonant system is characterized by (1) three nasal phonemes, and one or two (depending on the dialect) lateral phoneme(s), which in syllable-final position lose their contrast and are subject to assimilation to a following consonant; (2) three voiceless stops and the affricate /tʃ/; (3) three or four (depending on the dialect) voiceless fricatives; (4) a set of voiced obstruents—/b/, /d/, /ɡ/, and sometimes /ʝ/—which alternate between approximant and plosive allophones depending on the environment; and (5) a phonemic distinction between the “tapped” and “trilled” r-sounds (single ⟨r⟩ and double ⟨rr⟩ in orthography). Preantepenultimate stress (stress on the fourth-to-last syllable) occurs rarely, only on verbs with clitic pronouns attached (guardándoselos ‘saving them for him/her/them/you’). In addition to the many exceptions to these tendencies, there are numerous minimal pairs that contrast solely on stress such as sábana (‘sheet’) and sabana (‘savannah’); límite (‘boundary’), limite (‘[that] he/she limits’) and limité (‘I limited’); líquido (‘liquid’), liquido (‘I sell off’) and liquidó (‘he/she sold off’). Most Spanish speakers are in Hispanic America; of all countries with a majority of Spanish speakers, only Spain and Equatorial Guinea are outside the Americas. Nationally, Spanish is the official language—either de facto or de jure—of Argentina, Bolivia (co-official with Quechua, Aymara, Guarani, and 34 other languages), Chile, Colombia, Costa Rica, Cuba, Dominican Republic, Ecuador, El Salvador, Guatemala, Honduras, Mexico (co-official with 63 indigenous languages), Nicaragua, Panama, Paraguay (co-official with Guaraní), Peru (co-official with Quechua, Aymara, and “the other indigenous languages”), Puerto Rico (co-official with English), Uruguay, and Venezuela. Bilingual signage of Museum of the Sahrawi People’s Liberation Army in Western Sahara written in Spanish and Arabic. Spanish is also spoken in the integral territories of Spain in North Africa, which include the Spanish cities of Ceuta and Melilla, the Plazas de soberanía, and the Canary Islands archipelago (population 2,000,000), located some 100 km (62 mi) off the northwest coast of mainland Africa. In northern Morocco, a former Spanish protectorate that is also geographically close to Spain, approximately 20,000 people speak Spanish as a second language, while Arabic is the de jure official language. A small number of Moroccan Jews also speak the Sephardic Spanish dialect Haketia (related to the Ladino dialect spoken in Israel). Spanish is spoken by some small communities in Angola because of the Cuban influence from the Cold War and in South Sudan among South Sudanese natives that relocated to Cuba during the Sudanese wars and returned in time for their country’s independence. Early flag of the Filipino revolutionaries (“Long live the Philippine Republic!”). The first two constitutions were written in Spanish. The variety with the most speakers is Mexican Spanish. It is spoken by more than twenty percent of the world’s Spanish speakers (more than 112 million of the total of more than 500 million, according to the table above). One of its main features is the reduction or loss of unstressed vowels, mainly when they are in contact with the sound /s/. The phoneme /θ/ (spelled c before e or i and spelled ⟨z⟩ elsewhere), a voiceless dental fricative as in English thing, is maintained by a majority of Spain’s population, especially in the northern and central parts of the country. In other areas (some parts of southern Spain, the Canary Islands, and the Americas), /θ/ doesn’t exist and /s/ occurs instead. The maintenance of phonemic contrast is called distinción in Spanish, while the merger is generally called seseo (in reference to the usual realization of the merged phoneme as [s]) or, occasionally, ceceo (referring to its interdental realization, [θ], in some parts of southern Spain). In most of Hispanic America, the spelled ⟨c⟩ before ⟨e⟩ or ⟨i⟩, and spelled ⟨z⟩ is always pronounced as a voiceless dental sibilant. The debuccalization (pronunciation as [h], or loss) of syllable-final /s/ is associated with the southern half of Spain and lowland Americas: Central America (except central Costa Rica and Guatemala), the Caribbean, coastal areas of southern Mexico, and South America except Andean highlands. Debuccalization is frequently called “aspiration” in English, and aspiración in Spanish. When there is no debuccalization, the syllable-final /s/ is pronounced as voiceless “apico-alveolar” sibilant or as a voiceless dental sibilant in the same fashion as in the next paragraph. The sound that corresponds to the letter ⟨s⟩ is pronounced in northern and central Spain as a voiceless “apico-alveolar” sibilant [s̺] (also described acoustically as “grave” and articulatorily as “retracted”), with a weak “hushing” sound reminiscent of retroflex fricatives. 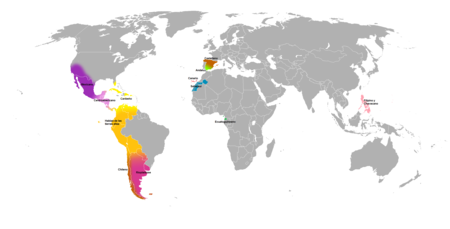 In Andalusia, Canary Islands and most of Hispanic America (except in the Paisa region of Colombia) it is pronounced as a voiceless dental sibilant [s], much like the most frequent pronunciation of the /s/ of English. Because /s/ is one of the most frequent phonemes in Spanish, the difference of pronunciation is one of the first to be noted by a Spanish-speaking person to differentiate Spaniards from Spanish-speakers of the Americas. The phoneme /ʎ/ spelled ⟨ll⟩, palatal lateral consonant sometimes compared in sound to the sound of the ⟨lli⟩ of English million, tends to be maintained in less-urbanized areas of northern Spain and in highland areas of South America. Meanwhile, in the speech of most other Spanish-speakers, it is merged with /ʝ/ (“curly-tail j“), a non-lateral, usually voiced, usually fricative, palatal consonant, sometimes compared to English /j/ (yod) as in yacht and spelled ⟨y⟩ in Spanish. As with other forms of allophony across world languages, the small difference of the spelled ⟨ll⟩ and the spelled ⟨y⟩ is usually not perceived (the difference is not heard) by people who do not produce them as different phonemes. Such a phonemic merger is called yeísmo in Spanish. In Rioplatense Spanish, the merged phoneme is generally pronounced as a postalveolar fricative, either voiced [ʒ] (as in English measure or the French ⟨j⟩) in the central and western parts of the dialectal region (zheísmo), or voiceless [ʃ] (as in the French ⟨ch⟩ or Portuguese ⟨x⟩) in and around Buenos Aires and Montevideo (sheísmo). Virtually all dialects of Spanish make the distinction between a formal and a familiar register in the second-person singular and thus have two different pronouns meaning “you”: usted in the formal and either tú or vos in the familiar (and each of these three pronouns has its associated verb forms), with the choice of tú or vos varying from one dialect to another. The use of vos (and/or its verb forms) is called voseo. In a few dialects, all three pronouns are used, with usted, tú, and vos denoting respectively formality, familiarity, and intimacy. In voseo, vos is the subject form (vos decís, “you say”) and the form for the object of a preposition (voy con vos, “I am going with you”), while the direct and indirect object forms, and the possessives, are the same as those associated with tú: Vos sabés que tus amigos te respetan (“You know your friends respect you”). The use of the pronoun vos with the verb forms of tú (vos piensas) is called “pronominal voseo“. Conversely, the use of the verb forms of vos with the pronoun tú (tú pensás or tú pensái) is called “verbal voseo“. Usted is the usual second-person singular pronoun in a formal context, but it is used jointly with the third-person singular voice of the verb. It is used to convey respect toward someone who is a generation older or is of higher authority (“you, sir”/”you, ma’am”). It is also used in a familiar context by many speakers in Colombia and Costa Rica and in parts of Ecuador and Panama, to the exclusion of tú or vos. This usage is sometimes called ustedeo in Spanish. Most speakers use (and the Real Academia Española prefers) the pronouns lo and la for direct objects (masculine and feminine respectively, regardless of animacy, meaning “him”, “her”, or “it”), and le for indirect objects (regardless of gender or animacy, meaning “to him”, “to her”, or “to it”). The usage is sometimes called “etymological”, as these direct and indirect object pronouns are a continuation, respectively, of the accusative and dative pronouns of Latin, the ancestor language of Spanish. Deviations from this norm (more common in Spain than in the Americas) are called “leísmo“, “loísmo“, or “laísmo“, according to which respective pronoun, le, lo, or la, has expanded beyond the etymological usage (le as a direct object, or lo or la as an indirect object). Some words can be significantly different in different Hispanophone countries. Most Spanish speakers can recognize other Spanish forms even in places where they are not commonly used, but Spaniards generally do not recognize specifically American usages. For example, Spanish mantequilla, aguacate and albaricoque (respectively, ‘butter’, ‘avocado’, ‘apricot’) correspond to manteca (word used for lard in Peninsular Spanish), palta, and damasco, respectively, in Argentina, Chile (except manteca), Paraguay, Peru (except manteca and damasco), and Uruguay. Mutual intelligibility of the written Spanish and Portuguese languages is remarkably high, and the difficulties of the spoken forms are based more on phonology than on grammatical and lexical dissimilarities. Ethnologue gives estimates of the lexical similarity between related languages in terms of precise percentages. For Spanish and Portuguese, that figure is 89%. Italian, on the other hand its phonology similar to Spanish, but has a lower lexical similarity of 82%. Mutual intelligibility between Spanish and French or between Spanish and Romanian is lower still, given lexical similarity ratings of 75% and 71% respectively. And comprehension of Spanish by French speakers who have not studied the language is much lower, at an estimated 45%. In general, thanks to the common features of the writing systems of the Romance languages, interlingual comprehension of the written word is greater than that of oral communication. 6. From Basque esku, “hand” + erdi, “half, incomplete”. Notice that this negative meaning also applies for Latin sinistra(m) (“dark, unfortunate”). Judaeo-Spanish, also known as Ladino, is a variety of Spanish which preserves many features of medieval Spanish and Portuguese and is spoken by descendants of the Sephardi Jews who were expelled from Spain in the 15th century. Conversely, in Portugal the vast majority of the Portuguese Jews converted and became ‘New Christians’. Therefore, its relationship to Spanish is comparable with that of the Yiddish language to German. Ladino speakers today are almost exclusively Sephardi Jews, with family roots in Turkey, Greece, or the Balkans, and living mostly in Israel, Turkey, and the United States, with a few communities in Hispanic America. Judaeo-Spanish lacks the Native American vocabulary which was acquired by standard Spanish during the Spanish colonial period, and it retains many archaic features which have since been lost in standard Spanish. It contains, however, other vocabulary which is not found in standard Spanish, including vocabulary from Hebrew, French, Greek and Turkish, and other languages spoken where the Sephardim settled. Spanish is written in the Latin script, with the addition of the character ⟨ñ⟩ (eñe, representing the phoneme /ɲ/, a letter distinct from ⟨n⟩, although typographically composed of an ⟨n⟩ with a tilde). Formerly the digraphs ⟨ch⟩ (che, representing the phoneme /t͡ʃ/) and ⟨ll⟩ (elle, representing the phoneme /ʎ/), were also considered single letters. However, the digraph ⟨rr⟩ (erre fuerte, ‘strong r’, erre doble, ‘double r’, or simply erre), which also represents a distinct phoneme /r/, was not similarly regarded as a single letter. Since 1994 ⟨ch⟩ and ⟨ll⟩ have been treated as letter pairs for collation purposes, though they remained a part of the alphabet until 2010. Words with ⟨ch⟩ are now alphabetically sorted between those with ⟨cg⟩ and ⟨ci⟩, instead of following ⟨cz⟩ as they used to. The situation is similar for ⟨ll⟩. The acute accent is used, in addition, to distinguish between certain homophones, especially when one of them is a stressed word and the other one is a clitic: compare el (‘the’, masculine singular definite article) with él (‘he’ or ‘it’), or te (‘you’, object pronoun) with té (‘tea’), de (preposition ‘of’) versus dé (‘give’ [formal imperative/third-person present subjunctive]), and se (reflexive pronoun) versus sé (‘I know’ or imperative ‘be’). When u is written between g and a front vowel e or i, it indicates a “hard g” pronunciation. A diaeresis ü indicates that it is not silent as it normally would be (e.g., cigüeña, ‘stork’, is pronounced [θiˈɣweɲa]; if it were written *cigueña, it would be pronounced *[θiˈɣeɲa]). The Real Academia Española (Royal Spanish Academy), founded in 1713, together with the 21 other national ones (see Association of Spanish Language Academies), exercises a standardizing influence through its publication of dictionaries and widely respected grammar and style guides. Because of influence and for other sociohistorical reasons, a standardized form of the language (Standard Spanish) is widely acknowledged for use in literature, academic contexts and the media. Paraguay (1927), Dominican Republic (1927), Bolivia (1927), Nicaragua (1928), Argentina (1931), Uruguay (1943), Honduras (1949), Puerto Rico (1955), United States (1973) and Equatorial Guinea (2016). The Instituto Cervantes (Cervantes Institute) is a worldwide nonprofit organization created by the Spanish government in 1991. This organization has branched out in over 20 different countries, with 75 centers devoted to the Spanish and Hispanic American cultures and Spanish language. The ultimate goals of the Institute are to promote universally the education, the study, and the use of Spanish as a second language, to support methods and activities that help the process of Spanish-language education, and to contribute to the advancement of the Spanish and Hispanic American cultures in non-Spanish-speaking countries. The Institute’s 2015 report “El español, una lengua viva” (Spanish, a living language) estimated that there were 559 million Spanish speakers worldwide. Its latest annual report “El español en el mundo 2018” (Spanish in the world 2018) counts 577 million Spanish speakers worldwide. Among the sources cited in the report is the U.S. Census Bureau, which estimates that the U.S. will have 138 million Spanish speakers by 2050, making it the biggest Spanish-speaking nation on earth, with Spanish the mother tongue of almost a third of its citizens. ^ Hammarström, Harald; Forkel, Robert; Haspelmath, Martin, eds. (2017). “Spanish”. Glottolog 3.0. Jena, Germany: Max Planck Institute for the Science of Human History. ^ Note that in English, “Castilian” or “Castilian Spanish” may be understood as referring to European Spanish (peninsular Spanish) to the exclusion of dialects in the New World or to Castilian Spanish to the exclusion of any other dialect, rather than as a synonym for the entire language. ^ Mikael Parkvall, “Världens 100 största språk 2007” (The World’s 100 Largest Languages in 2007), in Nationalencyklopedin. Asterisks mark the 2010 estimates for the top dozen languages. ^ “Summary by language size”. ^ “Logga in på NE”. www.ne.se. ^ “Spanish languages “Becoming the language for trade” in Spain and”. sejours-linguistiques-en-espagne.com. Archived from the original on 18 January 2013. Retrieved 11 May 2010. 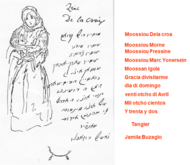 ^ Cervantes, Biblioteca Virtual Miguel de. “La época visigoda / Susana Rodríguez Rosique | Biblioteca Virtual Miguel de Cervantes”. www.cervantesvirtual.com (in Spanish). ^ “Official Languages | United Nations”. www.un.org. Retrieved 19 November 2015. ^ “El español se atasca como lengua científica”. Servicio de Información y Noticias Científicas (in Spanish). 5 March 2014. Retrieved 29 January 2019. ^ “Summary by language size”. Ethnologue. ^ “Most Studied Foreign Languages in the U.S”. Infoplease.com. Retrieved 20 August 2012. ^ US Census Bureau. “American Community Survey (ACS)”. ^ “Diccionario de la lengua española” (in Spanish). Buscon.rae.es. Retrieved 6 November 2010. ^ “Concise Oxford Companion to the English Language”. Oxford University Press. Retrieved 24 July 2008. ^ “Harold Bloom on Don Quixote, the first modern novel | Books | The Guardian”. London: Books.guardian.co.uk. 12 December 2003. Retrieved 18 July 2009. ^ “Spanish Language Facts”. Encyclopedia.com. Retrieved 6 November 2010. 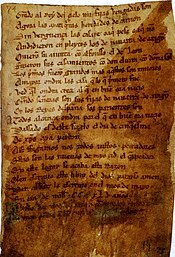 ^ “La lengua de Cervantes” (PDF) (in Spanish). 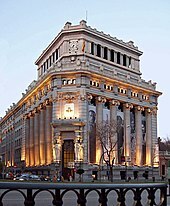 Ministerio de la Presidencia de España. Archived from the original (PDF) on 3 October 2008. Retrieved 24 August 2008. ^ “John B. Dalbor’s Voice Files to Accompany Spanish Pronunciation“. Auburn.edu. Archived from the original on 8 March 2012. Retrieved 20 August 2012. ^ “Instituto Cervantes 06-07” (PDF). Retrieved 21 April 2010. ^ “Most widely spoken Languages in the World”. Nations Online. Retrieved 27 August 2009. ^ “CIA The World Factbook United States”. Cia.gov. Retrieved 5 February 2011. ^ “Internet World Users by Language”. Miniwatts Marketing Group. 2008. ^ “Background Note: Andorra”. U.S. Department of State: Bureau of European and Eurasian Affairs. January 2007. Retrieved 20 August 2007. 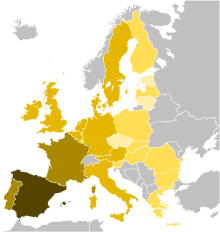 ^ “BBC Education — Languages Across Europe — Spanish”. Bbc.co.uk. Retrieved 20 August 2012. ^ “Swiss Federal Statistical Office > Languages”. Archived from the original on 30 October 2007. Retrieved 10 March 2014. ^ “Puerto Rico Elevates English”. the New York Times. 29 January 1993. Retrieved 6 October 2007. ^ “Population Census, Major Findings” (PDF). Belize: Central Statistical Office, Ministry of Budget Management. 2000. Archived from the original (PDF) on 21 June 2007. Retrieved 20 December 2007. ^ “Belize Population and Housing Census 2000”. CR: UCR. Retrieved 21 April 2010. ^ “Belize”. World Factbook. CIA. Archived from the original on 13 May 2013. Retrieved 5 February 2011. ^ “Brazilian Law 11.161”. Presidência da República. 5 August 2005. Retrieved 31 March 2014. ^ “Novo ensino médio terá currículo flexível e mais horas de aula”. O Globo. 23 September 2016. Retrieved 23 September 2016. ^ Lipski, John M (2006). Face, Timothy L; Klee, Carol A (eds.). “Too close for comfort? the genesis of “portuñol/portunhol““ (PDF). Selected Proceedings of the 8th Hispanic Linguistics Symposium. Somerville, MA: Cascadilla Proceedings Project: 1–22. Retrieved 29 December 2008. ^ U.S. Census Bureau (2007). “United States. S1601. Language Spoken at Home”. 2005–2007 American Community Survey 3-Year Estimates. Archived from the original on 5 January 2009. Retrieved 3 September 2009. ^ “Equatorial Guinea (2000)”. Ethnologue. Archived from the original on 25 December 2008. Retrieved 21 April 2010. ^ “CIA World Factbook – Equatorial Guinea”. CIA. 20 September 2007. Retrieved 5 February 2011. ^ “Como saharauis queremos conservar el español” (in Spanish). 3 March 2008. Retrieved 15 March 2015. ^ “Historia de un país” (in Spanish). Retrieved 15 March 2015. ^ “Estadisticas: El idioma español en Filipinas” (in Spanish). ES: Busco enlaces. 15 November 2000. Retrieved 6 November 2010. ^ Ocampo, Ambeth (4 December 2007). “The loss of Spanish”. Makati City, Philippines: Philippine Daily Inquirer (INQUIRER.net). Opinion. Archived from the original on 26 July 2010. Retrieved 26 July 2010. ^ “Presidential Decree No. 155 : PHILIPPINE LAWS, STATUTES and CODES : CHAN ROBLES VIRTUAL LAW LIBRARY”. Chanrobles.com. Retrieved 24 March 2014. ^ Rodríguez-Ponga, Rafael. “New Prospects for the Spanish Language in the Philippines”. Retrieved 1 March 2015. ^ Legaspi, Amita O. (3 July 2012). “PNoy (President Benigno Aquino III) and Spain’s Queen Sofia welcome return of Spanish language in Philippine schools”. GMA News. ^ “Spanish Influence on Language, Culture, and Philippine History”. Retrieved 15 March 2015. ^ Engelberg, Stefan. “The Influence of German on the Lexicon of Palauan and Kosraean (Dissertation)” (PDF). Retrieved 23 August 2012. ^ “Spanish language in Philippines”. Archived from the original on 18 March 2015. Retrieved 1 March 2015. ^ a b c d e f g h i j k “Cifras”, El español: una lengua viva (PDF) (in Spanish) (2015), ES: Instituto Cervantes, p. 10 Students across the World. ^ Data Access and Dissemination Systems (DADS). “American FactFinder – Results”. census.gov. ^ Taylor, Paul. “(2011)”. pewhispanic.org. Retrieved 24 March 2014. ^ “Census Bureau (01/July/2016)”. Census.gov. Retrieved 24 March 2014. ^ Gonzalez, Ana (13 August 2013). “(2011)”. pewresearch.org. Retrieved 24 March 2014. ^ “La amenaza al idioma español – Voces de Univision”. Univision.com. Archived from the original on 11 October 2011. Retrieved 20 August 2012. ^ “Reloj animado” (in Spanish). CO: DANE. Archived from the original on 16 January 2018. Retrieved 21 October 2018. ^ “Datos básicos” (in Spanish). ES: INE. 1 January 2016. Retrieved 2 January 2017. ^ “Argentinian census INDEC estimate for 2017”. Retrieved 24 March 2014. ^ According to Ethnologue (see “Argentina”. Ethnologue ), there were 40,3 million speakers Spanish as mother tongue in 2013. The Argentinian population in 2013 was projected to be 42,2 million. ^ Quispe Fernández, Ezio (2017). “Cifras” [Numbers] (PDF) (in Spanish). PE: INEI. ^ “PE”, Country, Ethnologue, There are 5,782,260 people who speak other language as mother tongue (main languages: Quechua (among 32 Quechua’s varieties) 4,773,900, Aymara (2 varieties) 661 000, Chinese 100,000). ^ “Informes” [Reports] (PDF). Proyecciones (in Spanish). CL: INE. 2017. p. 36. Archived from the original (PDF) on 14 February 2010. Retrieved 21 April 2010. ^ Ethnologue (19 February 1999). “(2011)”. Ethnologue. Retrieved 24 March 2014. ^ “Cuba”. Country (report). Ethnologue. Retrieved 20 August 2012. ^ “(2017)”. INE. Archived from the original on 11 October 2010. Retrieved 21 April 2010. ^ “INE (2017 estimate)”. Archived from the original on 19 May 2011. Retrieved 5 February 2011. ^ “INSEE estimate to 1/11/2012”. Insee.fr. Retrieved 20 August 2012. ^ “Eurostat 2015 estimation”. Istat.it. Retrieved 24 March 2014. ^ “ENEC estimation to 2016”. INEC. Archived from the original on 27 March 2012. Retrieved 5 February 2011. ^ “2016 INE estimation”. 2016. ^ “2015 US. census Bureau”. Archived from the original (PDF) on 23 December 2015. ^ “World Population Prospects: The 2015 Revi sion, Key Findings and Advance Tables” (PDF). United Nations Department of Economic and Social Affairs/Population Division. p. 15. Retrieved 10 January 2016. ^ “Euromonitor, 2012” (PDF). exteriores.gob.es. p. 32. ^ “Annual Mid year Population Estimates: 2013”. U.K. Gov. Census. 2014. Retrieved 20 April 2016. ^ “native knowledge speakers” (in Spanish). Realinstitutoelcano.org. 18 February 2009. Archived from the original on 9 February 2014. Retrieved 24 March 2014. ^ Nestor Diaz: More than 2 million Spanish speakers and around 3 million with Chavacano speakers (24 April 2010). “FILIPINAS / Vigoroso regreso del español”. Aresprensa.com. Retrieved 20 August 2012. ^ “Equatorial Guinea census”. Population statistics. 2010. Retrieved 21 April 2010. ^ “Eurostat (1/1/2012 estimate)”. Epp.eurostat.ec.europa.eu. 17 October 2013. Retrieved 24 March 2014. ^ There are 740,000 Hispanics in Canada in 2015, according to “Hispanovation: La creciente influencia hispánica en Canadá” (Social Media Week in Toronto): www.univision.com, www.abc.es. ^ “Netherland Census ClockPop”. Cbs.nl. Retrieved 20 August 2012. ^ “2011 Census”. Censusdata.abs.gov.au. Retrieved 24 March 2014. ^ “2071.0 – Reflecting a Nation: Stories from the 2011 Census, 2012–2013”. Abs.gov.au. Retrieved 14 June 2013. ^ “Eurostat estimate to 1/1/2011”. Epp.eurostat.ec.europa.eu. 2 April 2012. Retrieved 20 August 2012. ^ “Accueil – INSAE”. www.insae-bj.org. ^ Pages 34, 35 of the “Demografía de la lengua española”, page 35. ^ “Migration data” (PDF). iom.int. 2012. ^ Statistik, Bundesamt für. “Bevölkerung”. www.bfs.admin.ch. Archived from the original on 14 January 2016. ^ “cvc.cervantes.es (annuary 2006–07)” (PDF). ^ “cvc.cervantes.es”. cvc.cervantes.es. Retrieved 24 March 2014. ^ “czso.cz” (in Czech). czso.cz. 31 December 2013. Archived from the original on 31 March 2014. Retrieved 24 March 2014. ^ “(2012)”. ksh.hu. Retrieved 24 March 2014. ^ “Resultado 2010 – Persona”. Censo2010.aw. 6 October 2010. Archived from the original on 17 January 2012. Retrieved 20 August 2012. ^ “New Zealand census (2006)”. Stats.govt.nz. 13 February 2009. Archived from the original on 4 June 2010. Retrieved 24 March 2014. ^ “Press Release on Major Figures of the 2010 National Population Census”. Stats.gov.cn. Archived from the original on 18 April 2012. Retrieved 20 August 2012. ^ “Statistics – FAQ’s”. Gibraltar.gov.gi. 12 November 2012. Archived from the original on 5 January 2014. Retrieved 24 March 2014. ^ “(2013)”. db1.stat.gov.lt. Archived from the original on 19 August 2010. Retrieved 24 March 2014. ^ “Демография”. Gks.ru. 27 December 2011. Retrieved 24 March 2014. ^ “2009 estimate” (PDF). UN. 2008. Retrieved 21 April 2010. ^ “2010 Census”. Census.gov. Archived from the original on 21 December 2013. Retrieved 14 June 2013. ^ “Population – Key Indicators | Latvijas statistika”. Csb.gov.lv. Archived from the original on 28 June 2013. Retrieved 14 June 2013. ^ “::Welcome to Turkish Statistical Institute(TurkStat)’s Web Pages::”. TurkStat. Retrieved 20 August 2012. ^ “Census of India : Provisional Population Totals : India :Census 2011”. Censusindia.gov.in. Retrieved 24 March 2014. ^ “cervantes.es (page 6)” (PDF). Retrieved 24 March 2014. ^ “Jamaican Population”. Statinja.gov.jm. Retrieved 24 March 2014. ^ “cvc.cervantes.es” (PDF). Retrieved 24 March 2014. ^ “Eurostat – Tables, Graphs and Maps Interface (TGM) table”. Epp.eurostat.ec.europa.eu. 17 October 2013. Retrieved 24 March 2014. ^ “International Programs – People and Households – U.S. Census Bureau”. Census.gov. 5 January 2016. Archived from the original on 19 August 2012. Retrieved 20 August 2012. ^ “The 30 Most Spoken Languages in the World”. KryssTal. Retrieved 16 January 2013. ^ Webster’s Revised Unabridged Dictionary. MICRA, Inc. 1998. ^ The IPA symbol “turned y” (ʎ), with its “tail” leaning to the right, resembles, but is technically different from, the Greek letter lambda (λ), whose tail leans to the left. ^ Charles B. Chang, “Variation in palatal production in Buenos Aires Spanish”. Selected Proceedings of the 4th Workshop on Spanish Sociolinguistics, ed. Maurice Westmoreland and Juan Antonio Thomas, 54–63. Somerville, MA: Cascadilla Proceedings Project, 2008. ^ a b “Real Academia Española” (in Spanish). Buscon.rae.es. Retrieved 21 April 2010. ^ “Similar languages to Spanish”. EZGlot. ^ a b c Alfassa, Shelomo (December 1999). “Ladinokomunita”. Foundation for the Advancement of Sephardic Studies and Culture. Retrieved 4 February 2010. ^ “Scholarly Societies Project”. Lib.uwaterloo.ca. Archived from the original on 23 September 2010. Retrieved 6 November 2010. ^ “Association of Spanish Language Academies” (in Spanish). Asale. Archived from the original on 23 September 2010. Retrieved 5 February 2011. ^ “Real Academia Española”. Spain: RAE. Archived from the original on 29 September 2010. Retrieved 6 November 2010. ^ “Academia Colombiana de la Lengua” (in Spanish). Colombia. Archived from the original on 19 February 2008. Retrieved 5 February 2011. ^ “Academia Ecuatoriana de la Lengua” (in Spanish). Ecuador. Archived from the original on 27 May 2011. Retrieved 5 February 2011. ^ “Academia Mexicana de la Lengua”. Mexico. 22 September 2010. Archived from the original on 15 September 2010. Retrieved 6 November 2010. ^ “Academia Salvadoreña de la Lengua”. El Salvador. Archived from the original on 4 September 2011. Retrieved 5 February 2011. ^ “Academia Venezolana de la Lengua” (in Spanish). Venezuela. Archived from the original on 27 May 2011. Retrieved 5 February 2011. ^ “Academia Chilena de la Lengua”. Chile. Archived from the original on 5 September 2010. Retrieved 6 November 2010. ^ “Academia Peruana de la Lengua”. Peru. Archived from the original on 12 October 2010. Retrieved 6 November 2010. ^ “Academia Guatemalteca de la Lengua” (in Spanish). Guatemala. Archived from the original on 4 August 2008. Retrieved 5 February 2011. ^ “Academia Costarricense de la Lengua”. Costa Rica. Retrieved 6 November 2010. ^ “Academia Filipina de la Lengua Española” (in Spanish). Philippines. Archived from the original on 27 May 2011. Retrieved 5 February 2011. ^ “Academia Panameña de la Lengua”. Panama. Retrieved 6 November 2010. ^ “Academia Cubana de la Lengua”. Cuba. Retrieved 6 November 2010. ^ “Academia Paraguaya de la Lengua Española”. Paraguay. Archived from the original on 28 July 2011. Retrieved 5 February 2011. ^ “Academia Dominicana de la Lengua”. República Dominicana. Archived from the original on 22 December 2010. Retrieved 5 February 2011. ^ “Academia Boliviana de la Lengua”. Bolivia. Archived from the original on 29 November 2010. Retrieved 5 February 2011. ^ “Academia Nicaragüense de la Lengua” (in Spanish). Nicaragua. Archived from the original on 27 May 2011. Retrieved 5 February 2011. ^ “Academia Argentina de Letras”. Argentina. 25 March 2010. Retrieved 5 February 2011. ^ “Academia Nacional de Letras del Uruguay”. Uruguay. Archived from the original on 19 March 2011. Retrieved 5 February 2011. ^ “Academia Hondureña de la Lengua” (in Spanish). Honduras. Archived from the original on 27 May 2011. Retrieved 5 February 2011. ^ “Academia Puertorriqueña de la Lengua Española”. Puerto Rico. Retrieved 5 February 2011. ^ “Academia Norteamericana de la Lengua Española”. United States. Retrieved 5 February 2011. ^ “Academia Ecuatoguineana de la Lengua Española”. Equatorial Guinea. Retrieved 5 February 2016. Abercrombie, David (1967). “Elements of General Phonetics”. Edinburgh: Edinburgh University Press. Eddington, David (2000). “Spanish Stress Assignment within the Analogical Modeling of Language” (PDF). Language. 76 (1): 92–109. doi:10.2307/417394. JSTOR 417394. Harris, James (1967). “Sound Change in Spanish and the Theory of Markedness”. Language. Language. 45 (3): 538–52. doi:10.2307/411438. JSTOR 411438. Jensen, John B. (1989). “On the Mutual Intelligibility of Spanish and Portuguese”. Hispania. 72 (4): 848–852. doi:10.2307/343562. JSTOR 343562. Martínez-Celdrán, Eugenio; Fernández-Planas, Ana Ma. ; Carrera-Sabaté, Josefina (2003). “Castilian Spanish”. Journal of the International Phonetic Association. 33 (2): 255–59. doi:10.1017/S0025100303001373. “Hats Off: The Rise of Spanish”. The Economist. 1 June 2013. Erichsen, Gerald (20 May 2017). “Does Spanish Have Fewer Words Than English?”. ThoughtCo. Dotdash. “What is the future of Spanish in the United States?”. Pew Research Center. Retrieved 27 November 2018.